Large weight losses, however achieved, whether by dietary programs, exercise, or surgical procedure are extremely important in the overall health of individuals and are to be congratulated, supported and encouraged. However, such weight losses may bring a new set of problems which include skin and tissue that is not able to recoil and accomodate the weight loss resulting in sagging and wringling of the skin and subcutaneous tissue. Such sagging can be excessive and is determined by the amount of weight loss and the age of the patient at the time of the loss. Often, the overlapping of tissues may create inflammation and irritations. The areas of commonly treated are the abdomen, the outer thighs and buttocks, the inner thighs, the upper arms, breasts, face and neck. Liposuction of the neck may be done in conjunction with other facial plastic procedures such as facelift and necklift. Removal of excess, sagging, redundant skin and fat is done through incisions along the lower aspect of the abdomen as well as vertical incisions at times. Following removal of those tissues, the abdomenal muscles can be strengthened. See Abdomenoplasty. This can be done in conjunction with liposuction of specific areas. This procedure reduces what is known as the ‘bat-wing’ deformity of the upper arms. The incision usually high in the axilla [armpit] and can extend downward toward the elbow in various lengths determined by need. The incision is placed in the most inconspicuous area between the inside and back of the arm so it is essentially not seen when the arm is down and in normal activities. It may also be done in conjunction with liposuction to the arm to define muscles and and around the elbow area. As a result of surgery, the arm is reshaped and reduced in size. Brachioplasty allows patients to generally wear normal clothing with normal sleeve sizes as a result of the size reduction. The thigh lift removed sagging and excessive skin of the buttock and the thighs. lifting and removing tissues along the buttock fold, the lateral [side] thighs become smoother. 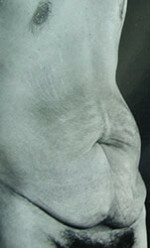 The buttock fold can be reconstituted and the buttocks made firmer. The inside thighs can occasionally be improved by extension of the incision along the inside of the thighs, high in and along the groin crease. This will help the inside thigh as well as the front of the thigh. This procedure is more involved than most plastic surgery procedures and is often done in a hospital setting. Anesthesia is usually general or epidural [spinal]. Scarring can e extensive and healing indeed takes time. However, the benefits may well outweigh the committment to healing and convalescence.